Mahickra Chemicals IPO is an SEM IPO filed recently, they are a manufacturer and supply of chemical dyes,and are all set to float an IPO in the market. The details of Mahickra Chemicals IPO review contains their IPO size, IPO offer price, IPO subscription, IPO release date, IPO allotment, IPO object, IPO grey market price and the details about the company and their promoters have been discussed in detail in this article. Mahickra Chemicals Limited is one of the leaders among manufacturers and suppliers & exporter of Dyestuffs. The IPO floated offers 21,00,000 equity shares which have a face value of Rs. 10 each. Of this shares, 1,08,000 equity shares have been reserved for market makers. Thus, the net equity shares offered to the general public is 19,92,000. The current paid up equity capital of the company holds 51,34,160 equity shares. This implies that the IPO constitutes almost 29% of the total post-issue paid up capital of the company. The lead managers appointed by Mahickra Chemicals Limited for this IPO are Pantomath Capital Advisors Private Limited. The registrar to the offer is Bigshare Services Private Limited. The IPO for Mahickra chemicals Limited will be releasing on Monday, 16 April 2018. The IPO would be open for 3 working days and would be closing on Wednesday, 18 April 2018. The number of equity shares that have been subscribed to will be updated on a daily basis herein. The details would be available only after the IPO opens in the market. Allotment status of the subscribed shares will be analysed and updated once the IPO is launched. Accordingly, this section will be updated after 18 April 2018. Mahickra Chemicals IPO offer price is fixed at between Rs. 24 to 25 per share. This implies that there is a premium of Rs. 15 per share. The IPO issue size refers to the quantum of share capital being raised by the company through the IPO. For determining the IPO size, IPO shares and IPO offer price are required. The IPO price is currently fixed at Rs. 25 per share and the IPO size is Rs. 5.25 crores. Of this, Rs. 4.98 crores is being offered to the public, the rest is reserved for market makers. Mahickra Chemicals is offering 21,00,000 equity shares. Out of this, 1,08,000 equity shares have been reserved for market makers and the balance 19.92 lac equity shares are for public. The equity shares carry a face value of Rs. 10 each. The authorised share capital of the company is Rs. 8 crores consisting of 80 lac equity shares with a face value of Rs. 10 each. 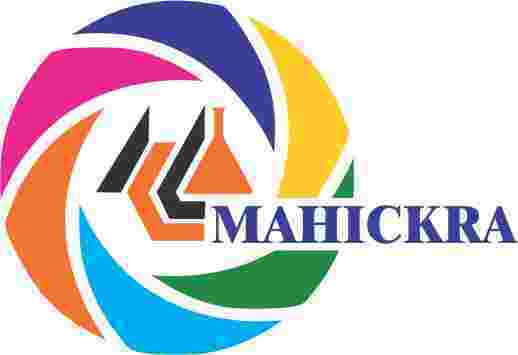 Mahickra Chemicals Limited is in the business of manufacturing of Reactive Dyes since year 1998, while the business of trading in Reactive Dyes was started in year 1994. The Company manufactures Reactive Dyes also known as Synthetic Organic Dyes (S.O.Dyes) and has an integrated process. The company specialises in Black Reactive Dyes. The company manufactures 40 various types of Reactive Dyes. The product of the company caters to textiles & garments manufacturers. The company also offer specialty performance chemicals to the Textile Dyeing and printing industry. The company has a production capacity of approx. 900 tons per annum. The manufacturing facility of the company is situated at Vatva GIDC in Gujarat. The facility is spread over 2 storeyed 700 sq. meters in area. The company is an ISO 9001:2015, ISO 14001:2015 and GOTS certified company certifying the quality of the product that the company manufactures. Mahickra Chemicals Limited have exhibited some real good growth. The PAT has gone more than double in the last two years. The EPS indicator also shows healthy financial position of the company. Thus, the company appears to be a great investment opportunity. The promoters of Mahickra Chemicals are interested in the Company to the extent that they have promoted and formed the Company and are interested to the extent of their shareholding and the dividend receivable. The Promoters can also be said to be interested in the Company to the extent of their shareholding/interest in the group company /or ventures promoted by them with which the Company transacts during the course of its operations. The promoters of the company are not interested in any of the properties of the Company. The Issue Price for Mahickra Chemicals shall be determined by the Company in consultation with the Book Running Lead Managers, on the basis of an evaluation of market demand for the Equity Shares issued through the Book Building Process and on the basis of quantitative and qualitative factors. Comparison with peers – Mahickra Chemicals ranks at 5th position on comparing with its peers. The grey market for Mahickra Chemicals Limited IPO has been open since a week almost and would continue till April 2018. The Kostak rate for this IPO is also out in the market and has been largely fluctuating. The details on this are available with most of the stock brokers agents.